This chapter offers a critical overview of how the ‘double transformation’ in Central and Eastern Europe (CEE) has been theorised in the academic literature. In particular, it looks at how dominant theoretical approaches—neoliberal and institutionalist—have accounted for (a) the origins of the shift towards (free) market economies and parliamentary democracies in the region; (b) the key actors and dynamics driving this process; (c) the theoretical explanations offered to account for the ‘anomalies’ of the transformation, such as the ‘transformational recession’ of the 1990s; and (d) the politics that flow from the different approaches. While highlighting their contributions to our understanding of the double transformation, it is argued that these approaches suffer from methodological, theoretical, and empirical limitations. 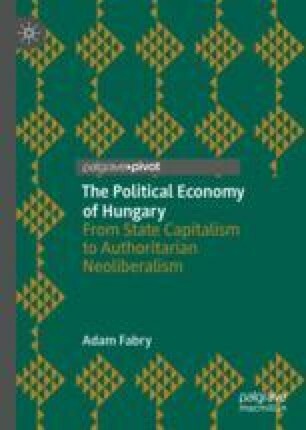 To overcome these shortcomings, the chapter advocates a Marxist political economy approach, which argues that the double transformation in CEE needs to be understood in relation to the wider restructuring of the capitalist world economy from the early 1970s onwards, while emphasising the forms through which competitive accumulation, class struggle (both between capital and labour, as well as different ‘fractions of capital’), and uneven and combined development shape the behaviour of policymakers, and the ability of states to ensure the reproduction of capital within their borders. Crowley, S. (2005). East European Labour, the Varieties of Capitalism, and the Expansion of the EU. Retrieved from http://councilforeuropeanstudies.org/files/Papers/Crowley.pdf. ‘Marx-Zasulich Correspondence 1881’. (n.d.). Retrieved April 9, 2018, from https://www.marxists.org/archive/marx/works/1881/zasulich/index.htm. Milanovic, B. (2014, November 3). For Whom the Wall Fell? A Balance-Sheet of Transition to Capitalism. Global Inequality Blog. Retrieved November 5, 2014, from http://glineq.blogspot.co.uk/2014/11/for-whom-wall-fell-balance-sheet-of.html?m=1. Sachs, J. (1990, June 13). What Is to Be Done? The Economist. Retrieved from http://www.economist.com/node/13002085.